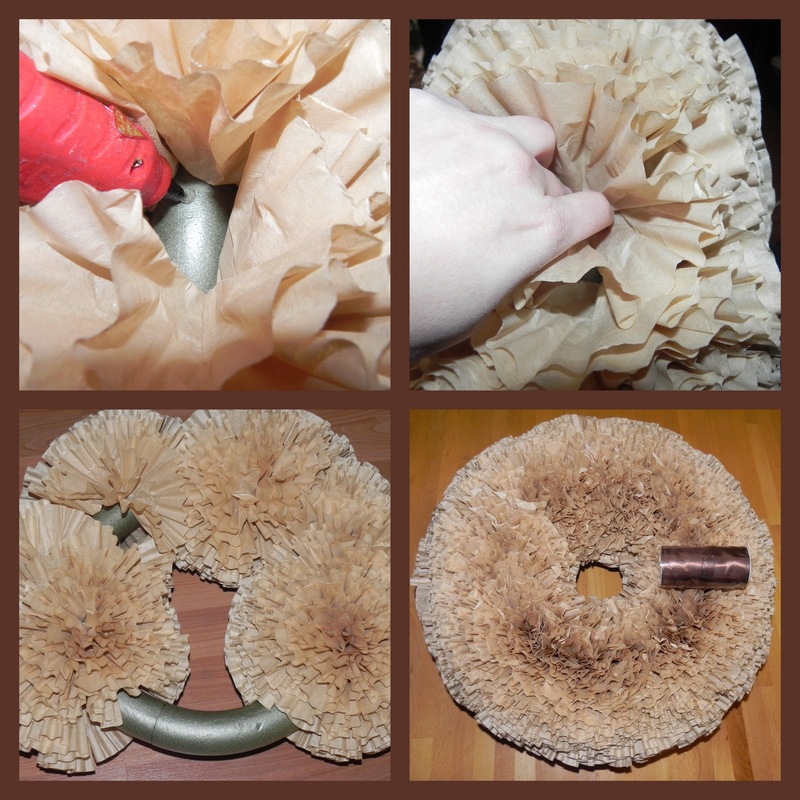 This week for my craft project I made an amazing brown coffee filter wreath. The first time I saw a coffee filter project was when I was browsing over at the Parlour blog and found her massive, beautiful here. I loved it! So I did what I do when I like something. I did a Google search. I was all set to make myself a beautiful white coffee filter wreath that resembled the snow outside. Then I came across the Little Brown House version . It was the same concept, but in brown. And I knew I HAD to do it! To complete this project you need a wreath form. I chose the biggest one Michael’s had to hang in my living room. I cost about $4 after my handy dandy coupon. You will also need a hot glue gun and a lot of glue. Then of course you need coffee filters. Lots and lots of coffee filters. Depending on the size and fullness you want to create, the number of filters will vary. I used around 400 for mine. Your best bets are to purchase at the dollar store, 200 for a dollar, if you are choosing to go with white. For the brown color you need to purchase the natural liners. Walmart has them for about $1.25 per 200. Finally, choose a ribbon for hanging. I have a beige, chocolate brown and light blue color scheme in my living room. I picked a chocolate ribbon with a four inch width. I am thinking in the spring of possibly doing a ribbon in blue to switch it up a bit. I will preface this by saying I am a perfectionist. I wanted the “ruffles” to be as even as possible. In order to do that, I would fold each coffee filter in half and then half again to find the center point. I would then unfold, grab the point and crumple it. From there the project is very easy, but time consuming. Just glue that center point to the wreath form. Word of caution, your fingers will get burned when working with the glue gun. How close you place the filters will determine the fullness of the wreath. I wanted a massive focal point for my mantle, so mine were placed very close together. If you are unsure about how big you want your wreath to be, start with fewer and farther between. You can always go back and add more. When you are finished, add your ribbon for hanging! I just looped my ribbon around and tied a bow so that later I can change the color if I so choose. Thanks for sharing both your wreath and the light fixture on the other blog…they are both BEAUTIFUL. I like the wreath idea, as it is smaller. Keep your posts coming. We all love to read them in the office. I love this- it is gorgeous! 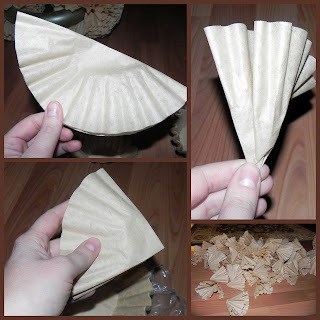 i recently saw a wall mural using coffee filters! who know you could do some much with them? this has inspired me to try a project of my own! Awesome! I love the color and how full it is:) I love seeing your crafty side! That is seriously Gorgeous!!! I love how full it is! You did an amazing job girlfriend! I would like to put it on my facebook page – hope that is ok? This is so beautiful! 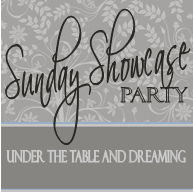 I was wondering what you had up your sleeve from your Facebook posts. I love your mirror, too. This is great! I've seen a lot of similar wreaths lately using different materials, but I LOVE how full this is. Great job! Love it! You did an awesome job. I just made it in white and I am so happy I finally made one! :o) Yours is fantastic!